Mommy Lessons 101: Library Storytimes - Key to Reading Success! Library Storytimes - Key to Reading Success! I have kids who completely crazy for reading. And they all started reading at a very young age. So people ask me frequently my tips and tricks for early readers. One of my favorite tips is going to library story times. I feel that kids learn valuable lessons simply from the structure of story time and the process of sitting down and listening. It helps foster a love for reading, which ultimately will be what gets your kids reading over and over again. Our story time is full of stories, games, songs, color, counting, finger plays and a craft to top it off. It's a 45 minute preschool for free each week and we LOVE it. *Here's a cute craft they made recently. 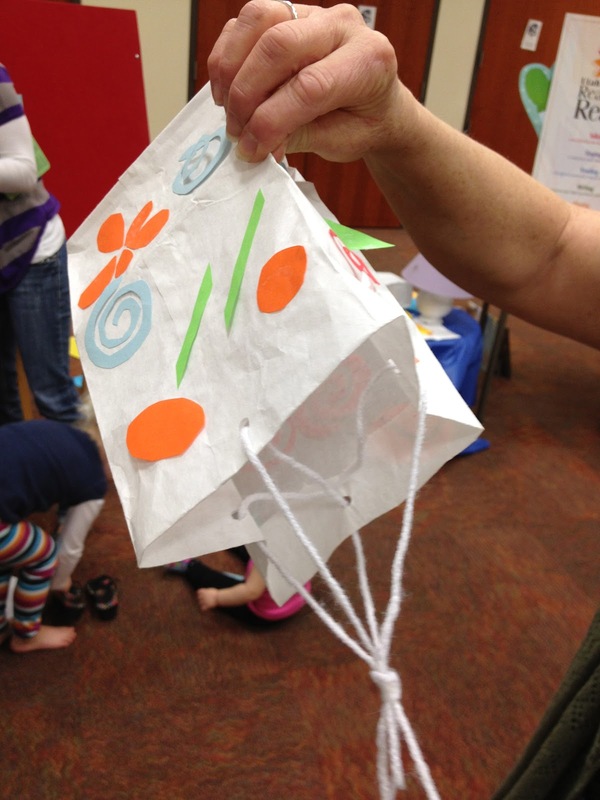 It's a kite made out of a lunch bag, string, colorful paper, and crepe paper. The kids cut out shapes and glued them to the lunch bag. They cut a hole in the top and put crepe paper through, giving the tail a kite. Then they put a piece of tape on the underside to hold the crepe paper in. Finally, they punched 4 holes - one on each side of the opening of the bag. Then they strung yarn through each hole making something to hold onto while you fly the kite. A very cute and simple craft! Rachel also shares below some of her favorite crafts and books they have done at library story times. Here are just a few of the crafts my kids have made at library story times in the last couple of months--the kids loved these crafts and books, and I loved that I didn't have to prepare or pay for the materials! *The kids used patterned scissors to cut out "clouds." On the clouds they were supposed to draw pictures of things that they dream about, and then they glued these clouds to blue paper. My kids LOVE cutting activities, so this was a big hit with them. *We cut holes out of the center of a paper plate, then glued shamrock cut-outs around the rim of the paper plate. The kids decorated the shamrocks with stickers and markers. Then, we taped a loop of yarn on the back so the wreaths could hang on something. *The kids glued hearts and circles together to make monkey faces, then they decorated the monkey faces with crayons and glued on hats and whatever other accessories they wanted (the librarian had printed out the accessories and cut them out for the kids to choose from). *We traced and cut out their hands and then folded down the pointer finger, pinky, and thumb. We glued these bunny heads and white oval bunny bodies to backgrounds that the kids decorated.